Few structures have as much influence over the body’s ability to function properly as the brain and spinal cord that make up the central nervous system. And, the central nervous system is heavily influenced by the craniosacral system and the membranes and fluid that surround, protect and nourish the brain and spinal cord. Craniosacral Therapy can help! Every day your body endures stresses and strains that it must work to compensate for. Unfortunately, these changes often cause body tissues to tighten and distort the craniosacral system. These distortions can then cause tension to form around the brain and spinal cord resulting in restrictions. This creates a barrier to the healthy performance of the central nervous system, and potentially every system it interacts with. Fortunately, these restrictions can be detected and corrected using simple methods of touch. 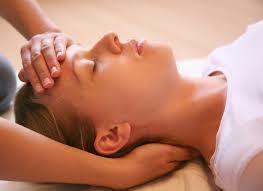 How does Craniosacral Therapy (CST)work? With a light touch, the CST practitioner uses his or her hands to evaluate the craniosacral system by gently feeling various locations of the body to test for the ease of motion and rhythm of the cerebrospinal fluid pulsing around the brain and spinal cord. Soft-touch techniques are used to release restrictions in any tissues influencing the craniosacral system. By normalizing the environment around the brain and spinal cord and enhancing the body’s ability to self-correct, CST is able to alleviate a wide variety of symptoms. Some of these include everything from chronic pain and sports injuries to stroke and neurological impairment. Craniosacral therapy (CST) is a form of bodywork using gentle touch to manipulate the synarthrodial joints of the cranium. A practitioner of cranial-sacral therapy may also apply light touches to a patient’s spine and pelvis. Practitioners believe that this manipulation regulates the flow of cerebrospinal fluid and aids in “primary respiration”. CST was developed by John Upledger, D.O. in the 1970s, as an offshoot of osteopathy in the cranial field. Craniosacral Therapy works to enhance the body’s own healing potential addressing more than just symptoms. CST is very relaxing and enjoyable to receive. Contact Glastonbury Massage Center today to see how our team of dedicated Licensed Massage Therapists can help you!